Washington, DC Department of Corrections incarcerated and reentry individuals experience changes in their viewpoint, in their behavior, in their standards of actions and in their personal relationships as a result of their participation in Criminon New Life DC seminars and courses. I’ve learned about myself and the mistakes I made. I started, when I was 17, smoking PCP, buying guns to protect myself, stealing cars and selling them, all to stay high. I lost my family because of PCP. I lost my mind because of the drug and alcohol I’ve abused. Now I’m 38 and my mind is gone. But I’m changing now, thanks to Criminon. I now see what drugs do to you. Now my life is healthy and strong. I am receiving help and my family stood by me because of the changes I made in my life thanks to Criminon. I get a different way of looking at life. Through this class I’ve come to an understanding that I’m responsible for my actions. I play a part in any situation I put myself in. Through Criminon I’ve learned that I have to care for the next person. Life is made of my experience and how I figure through them will show who I am. I care more and learned to love myself more. Today life is beautiful ’cause of the way I look at it now. I love the power I receive through Criminon. Power is knowledge. I’m recently serving time in DC Jail, and I got introduced to Criminon one year ago. Since then I have learned so much from this class. I have learned how to control my attitude in different circumstances. I always was not a friendly person because of the street life I was living prior to this. This class helped me to be open in a classroom and learn from the teacher and everybody’s point of view. So all together, I have learned to be more humble, to be open-minded, to listen more, to stop using drugs, and to live life in here and on the outside more safely and productively. Thank you to Criminon and to my teacher. My motive for writing you is to express my gratitude for your warm moments you all spend with us. Your time spent with us has helped me a lot in my life, because I am a different person in the way I think now than I used to be before – all because of your bringing the course to the Chapel – “The Way to Happiness”. I also sent a copy of the booklet to my eldest daughter and it also had a great influence in her life. On page 19 it says to “honor and help your parents” and whenever I call home and ask about her my wife will say to me how much of a help she is to her – all because of the copy of the “Way to Happiness”. I can’t find the words to say how grateful I am to all of you because at the moment I thought my life was all over I got hope because of the certificate and what I was able to accomplish from the course. I presented it to the judge and because of it I was able to get eight years and not life. I am taking some time to say a special thank you to all of you and many the Lord Jesus Christ bless you and keep you and make his face shine upon you. My name is L.J, and when I first started Criminon my life was chaotic. Although I sought happiness, it was hard because some of my thinking and actions were immoral. The environment here (inside DC Jail) wasn’t the best, but by my attending Criminon. I began to gain a better moral standing and view of life. The precepts of Criminon are applicable in everyday life. We all have an obligation to apply these precepts if we choose to be happy. It has been an honor to participate in Criminon, and I will continue to apply these precepts on my way to happiness. Thank you. Criminon has definitely left a lasting impression for me. I joined the course while the class was beginning the 17th chapter (Be Competent) of the literature book, The Way to Happiness, a Common Sense Guide to Better Living. This book is definitely a must read. The book is informative and will totally change your thought process; motivating you to be determined to incorporate these golden rules and virtues in your daily life. For me this class has nourished my soul and overall being. It not only teaches you to love self, respect self and care for your body/flesh, it teaches you to nourish your soul & become beautiful internally. Every chapter is amazing; and honestly, if one retains and practices these virtues and golden rules, they can not only learn to be happy & save their own soul, but can educate others with the knowledge they learned and help others to flourish and prosper and be happy. We all want happiness (I would hope); unfortunately, not everyone knows how to achieve it! However, I can guarantee that if you read this amazing, life-changing book, happiness will be ‘knocking’ at your door. 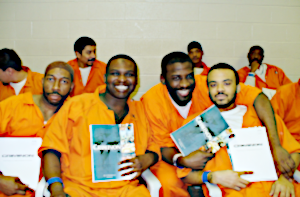 The Criminon instructors are a valuable asset to those inmates that attend Criminon, specifically me. I have attended 2 sessions so far and have gained a lot of character enlightenment from discussions and movies. I believe as the classes continue and I take more and more that I will become a better person. This class, especially the way [it is] structured to be taught, builds morals and principles. I would just like to acknowledge that I went to court with a Letter of Participation in the Criminon Program. The judge was truly impressed and said that she was going to look into making it mandatory for inmates to complete the program. Furthermore, I witnessed to the fact that I have benefited tremendously from Criminon. I affirmed that I gained absolute appreciate for self-worth, self-happiness, self-honesty and family orientation. Being as though my charges are solely based on drinking and alcohol abuse, The Way to Happiness Course has made me realize that I cannot achieve happiness or joy or prosper with an addiction. The Truth About Drugs course has worked wonders for me. The course was so thoroughly informative that I now know why I’ve suffered from so many DUI’s by way of alcohol abuse. There is no way that I will ever drink it any more, knowing that the long-term effects have definitely taken a toll on me and my way of thinking. It’s never too late to remap or reroute my journey in life and that’s the most important thing I’ve learned from The Truth About Drugs. I now realize that marijuana was my gateway drug that lead to me smoking crack cocaine. I’ve learned the way to deal with things in life and how to start leading a more happy life. As a result of my participation in the Criminon Program, I have learned exactly how and what I am doing to my body, my mind and my soul behind alcohol abuse. Criminon has also inspired me to be productive and to seek prosperity. Lastly, I have learned that the only way to true-blue happiness and success is to love myself first and treat others the way I want to be treated. Drugs and alcohol do not bring any form of fulfillment and Criminon has taught me this as well. I am going to be the best I can be. God bless you, and thank you Criminon. What I learned: To live my life productive, to practice and teach my children morals and to obey all laws. To live righteous and to never give up and always reach for your goals. This is to let you know that this Criminon class is a way for me to change my life. To know that I went on for years putting poison in my body. I know that today I have a goal of wanting to change. I can actually look back at my past and laugh. I’ve learned that there are ways that I can deal with problems on a positive note. My bad behavior is not going to weigh me down any more. It is starting with changing my people, places and things that I do. This class has shown me the highs and lows of staying on top of my life. I can use the booklet in my everyday life. In Criminon, I’ve learned not to be a criminal and to be happy in my new beginning and change.